Mason had a blast with his Talking Ben. It was pretty funny. When you pushed his paw, Talking Ben would repeat everything he heard. This spurred a super long conversation with my talkative toddler. Check out the video below to see just how cute Talking Ben is in action. I shortened it to 30 seconds. He played with Tom all day long and actually gave me a break from the endless questions. Finally, my son met someone who gabs just as much as he did! This holiday season grab some of the great new talking stuffed animals for kids. There are a lot of hip and fun games out on the market racing to come in first in the seasonal shopping list, but few get the chance to get to be a show stopper. Word is, a few of the most wanted presents on children’s Wish List this year are interactive games such as video games or interactive apps. One of the hottest things on this season’s market comes from a great company by the name of Cuddle Barn. The newest member of their Talking Friends family is Talking Tom. Imaginary friends are a thing of the best now that Talking Tom has come to town. He is a pet cat who, when talked to, will repeat everything that was said in a funny voice. Cuddle Barn has provided extra languages such as Chinese, French, German to fit in any home. Talking Tom also loves to be pet while purring in return to show his satisfaction of the praise. He even responds to poking him or pulling at his tail. This is a great game for kids. He also invited his old friend, Talking Ben, to come join the fun! Talking Ben is a retired chemistry professor who likes his quiet time while reading his newspaper. He can be kind of fussy about interaction, but the more tickling and poking he receives the shorter time it takes him to fold down his newspaper in order to carry on conversation. 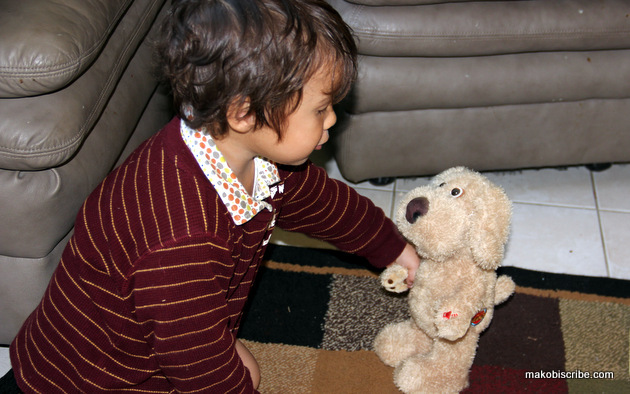 He will even talk on the telephone to make it a bit more fun for children to interact with. Cuddle barn has some great games for kids along with more amazing Talking Tom and Ben products at their Specialty Gift Shop. From now until December 13, 2012, they are sharing their special code TOM2012 to get $5.00 off the price of each Tom and Ben purchased in their online store. They are even offering free shipping anywhere in the continental US. Make these great games the top of each kid’s Wish List this year. One reader will win a Talking Ben, a $35.00 value from Makobi Scribe. Make sure you watch the video above for extra points! Santa Boo Boo Bear And Later Gator. Vacation Monty is too cute. I think the Storytime Teddie is cute. Thanks for this contest. OMG, I love Paddy. So cute! I like the Diva Debbie. From the Zoocational line – I like Twiggy the Giraffe. I like the singing beaver. I like Baking Betty. How cute is she!? Talking Ben is my most favorite ! I like the Moos Like Jagger! I LOVE them all!! I think my favorite is Hunny Bear, I told my husband to buy it for me! The Peek a Bunny is cute! I like Diva Debbie and The Birthday Bear! I love the elephant and the turtle. I am a horse lover, so gallop is for me!!! Moose Wonderful is my favorite. They are all so cute, but, I think I would pick Elvis T.B. I like Bebe or Mother Goose to give as a newborn gift. My parents gave my firstborn a singing teddy bear and he would bop to it when he was 3 months old and still loves to hear it sing now that he is 4. The Cuddle Barn characters are really cute. The Moos Like Jagger is my fav! Moose On Da Loose is my favorite. I like the Truman Turtle. Favorite product is Tusker the elephant. I would love to have the Elvis – Teddie B.
I Ike talking Tom and Ben because my daughter loves playing with those apps on our iPad. I like the Santa Boo Boo Bear! I like the Christmas Odie!! Moos Like Jagger! Too cute! My favorite product is Mother Goose. My granddaughter would love Manny the Manatee (Zoocational). Heartthrob Henry would just go crazy. She is obsessed with One Direction. She also loves Selena Gomez so Sassy Sally would be a good one, too. My favorite is the Bedtime Bear. I meant she would just go crazy for Heartthrob Henry. I like the Beaver or Tusker the Elephant. Cute idea! I like Elvis – Jailhouse Johnny. I love the talking twiggy giraffe! Manny the manatee is my grand babies favorite! My daughter would love Twiggy the Giraffe! We like Manny the Manatee. I like the Christmas Odie! I love the Moos Like Jagger. Talking Ben is ADORABLE. I must get them for my twins! I think Twiggy the Giraffe is cute.